Our Intelligent Wheel Flange Lubrication (iWFL) system, is an on-board intelligent dispensing system, designed to improve rail safety whilst reducing wheel wear - saving time, money and lives. Over the years there have been a significant number of train and tram derailments caused by heavily worn track. Evidence shows that lubrication of the interface between the rail’s gauge corner and the wheel’s flange root reduces the wear and rolling contact fatigue on the wheel and rail. It’s our belief that an intelligent use of lubrication can increase safety and reduce the chances of further fatalities. In order to extend rail and wheel life, it uses geographical location based dispensing of flange lubrication. Its intelligent design senses the location and intensity of track curves using a combination of GPS signals, speed and inertial sensors. The unit processes the data and applies lubricant precisely at the location required. When iWFL is used in conjunction with our flange lubrication, you will see an improvement in rail safety by up to a 50% reduction in friction and rail wear*. The combination of iWFL and our Top of Rail Friction Modifier (ITORFM) improves fuel economy by 10 - 15%. Additionally, noise is surpressed, track forces are reduced and braking is not compromised. 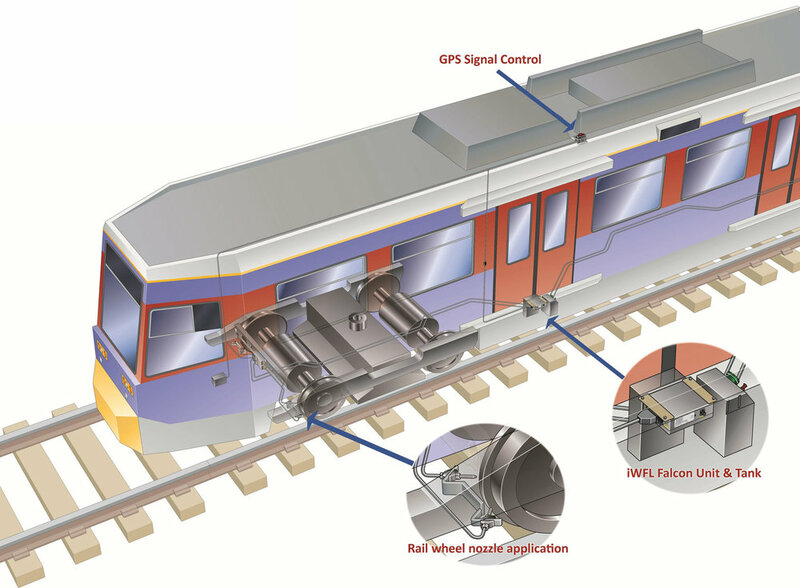 • Interfaces to train management systems, track balises and GPS antenna. • Can be dispensed via top of rail or back of flange. • Full control of dispensing nozzles. • Wheel and track wear are greatly reduced, extending service and maintenance intervals, reducing down-time and costs. • Standalone / fall-back inertial (YAW, acceleration and distance) based operation mode. • No impairment of braking safety. • iWFL reduces wheel ‘screech’ noise levels, therefore improving passenger comfort and noise pollution. • Inertial sensing provides targeted application of lubrication, preventing wastage of the lubricant and a reduction in trackside lubrication. • Reduction of rolling contact fatigue with the rail track reduces fuel and power consumption, therefore costs associated with this. • Creates a reduction in trackside forces and associated risk of derailment. Independent tests have shown iWFL does not affect train braking distances. Interested in iWFL? Fill in the online form here http://bit.ly/iWFL_Enquiry and one of our sales team will be in contact with you shortly.